In organic farming, there is more dependency on farm based inputs like Farm yard manure,compost etc. 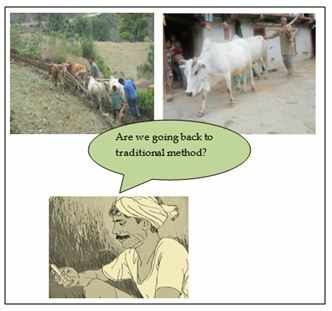 Does it mean that we are going back to traditional method? Back to Traditional method or moving a step ahead ? Organic agriculture should not be viewed as traditional method of agriculture .It is different from traditional method. Organic farming is the modern approach to farming. Most of the traditional methods of agriculture are still significant and are in use by the farmers. In organic farming, the farmers are using these methods along with the upcoming new & modern scientific knowledge. So, organic farming is the combination of some significant traditional farming methods and the upcoming new & modern scientific knowledge. Organic farming is infact a system of farming in which a balance between nature and farming is established. All available upcoming knowledge and techniques is combine with the significant method of traditional farming so as to have sustainable production .